It is a software which is capable of preventing, detecting and eliminating any malicious program or file that is located in your computer, in order to be able to prevent any damage that it could cause, through the propagation or transmission among viruses through all the system. Currently, antivirus software are more specialized in the prevention, leaving a little bit aside disinfection. This software was initially used in the 80’s decade, and little by little it has been optimizing its labor by having much more complete search engines and updates. Usually, antivirus software are based in the early blockage in real time of a future infection, which could be the cause of a harmful code to appear. The distributor companies are opting for incrementing the field of disinfection by immunizing other types of viruses, such as spyware, risk ware, worms, malware, Trojans, etc. Due to the variety of infectious programs, there are thousands of antivirus software, whose analysis and elimination systems are different. Even though antivirus software follow a basic operation pattern, for example, they should have a list of all the viruses that have been currently detected in all over the world. What the antivirus software does is to gather all this information through the updates and, then, it scans the computer to detect if there is some virus that is in the black list. Antivirus software have on their content certain applications like, for example, vaccines, which consist in filtering the programs that are been executed in the system in real time; another is the detector, which is a classic application that analyzes all the files that are stored in the computer or simply in the direction that it is set to work on and, usually, most of the viruses that cannot be disinfected pass to be on quarantine so they are blocked; the eliminator is the final process of the software, viruses can be deleted, erased or set on quarantine and, also, the documents that have been infected, with the virus, so there is no possibility of infecting other files. Nowadays, there are diverse antivirus software, which have different ways of acting, but there are known methods which are used all over the world, such as the heuristic method, which supports itself in the detection through generic signatures, detection of compiled codes, unwrapping, disassembling, etc. This technique is used when it is impossible to find optimum solutions and it finds little instances of short tern alternative solutions. Another very used factor is the HIPS mode, which acts as a precaution before possible intrusions that want to host in your computer and provide from the internet and, also from the treathsense.net, to get early alerts, HTTP, POP3 protocols filtration, internet traffic and e – mail protections. Kaspersky counts with a free online antivirus software, on which you have to upload some files in order to have them analyzed; it can work in a second scale. 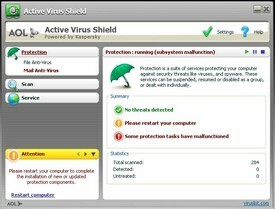 Another antivirus software that comes from the engine of Kaspersky labs and that is developed by the AOL company is called Active Virus Shield, and it has automatic updates, e – mail address following up, real time detection, it is much lighter and can be downloaded for free from http://active-virus-shield.uptodown.com/. The NOD 32 antivirus software is another of the top software that you can find and its best strength is its lightness when scanning the computer, besides from counting with automatic updates, heuristics, real time protection, antispam support, firewall for several e – mail addresses and to download a free test you can visit this page http://www.nod32.com .